Having a case of the Monday blues? Not here in Haida Gwaii – what a fishy week it has been so far! With the heavy weekend winds settling down to 5-10 mph, QCL guests and guides started the week out right – with lots of sun, loaded fish boxes, and big smiles to match! With the mid-season approaching, QCL staff are definitely in the rhythm of the game – getting to enjoy some sunny weather and staff fishing charters is putting everyone in great moods! Coho are still running rampant through the fishing grounds, with some beautiful 10-12 lbers coming through to the scale. It’s easy fishing if you’re looking to limit out on these Silvers! While 15-20 lb feeder-sized Chinook are also consistent throughout the grounds, the real action this week began on Monday with four Tyees caught by our QCL guests! We don’t mean to brag (well, just a little), but the following anglers were nothing but winners at the weigh scale! Guest Jim T. was lucky enough to land a beautiful 37 lb Chinook – Adam D. caught and released a 45 pounder – Guest Danny B. landed a stunning 50 pounder (on a Tiger Prawn spoon!) 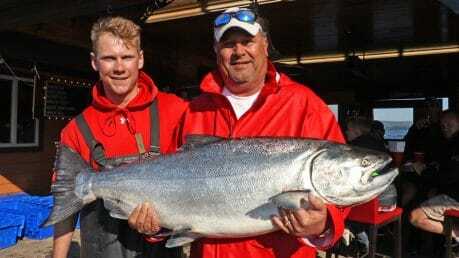 with his guide Kyle Hedican – and last but certainly not least – Santiago C. scooped up a nice 41 lb Chinook to take home! Congratulations and well-done to these fishermen! We’re looking forward to seeing the rest of the Catch from this trip! Tight lines!